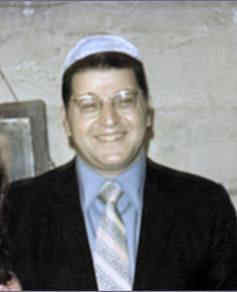 Hakham Yosef (“Joe”) Hamoui founded the Ahaba ve Ahva community on 66th Street in Brooklyn after moving to the United States from Egypt in his 30s. As president of the synagogue, he had the talent of combining dedication and creativity. He succeeded in making a relatively smooth transition to the new environment with the help of his committee and father-in-law Hakham Halfon Safdie zt"l. In addition to keeping his schedule of Hazzanut, Qeria't HaTorah and learning, Hakham Yosef started spreading his teachings to all age groups of the community. Many Bar Missvah students recall his patience and loving guidance in instruction. Hakham Yosef and his wife, Rosie, were also known for their tremendous hospitality, hosting messengers from around the world seeking financial aid for their yeshivot. Hakham Yosef also made his impact on other communities on the East Coast, including helping to establish a Sepharadi community in Boston in 1980. Hakham Yosef passed away in May 1992. 4862 גלמן קד צוורק Maqam Hoseni "Galman Qad Sawarq" is an Arabic melody that is traditionally applied to EH or Qaddish on Shabbat Yitro, Vaethanan, or Shabbat Kalla.